The NEW Machine Simulation PRO Add-on offers state of the art toolpath simulation technology for BobCAD-CAM CNC programming software. 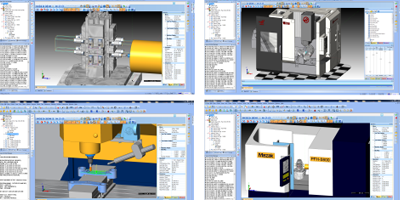 The Machine Simulation PRO Add-on can be easily added to any of the latest BobCAD-CAM & BobCAM for SOLIDWORKS™ core CAD-CAM products giving you full advantage of all the NEW advanced simulation technology benefits! The simulation will allow you to set machine travel limits and detect over travels. The all-new Version 29 CAD-CAM software makes CNC programming faster, easier, and more efficient than ever before. It builds on 30 years of CAD-CAM innovation which includes a powerful 2D & 3D CAD design system, an easy to use wizard driven CAM Programming interface, Dynamic Machining Strategies™, advanced 2-5 axis high speed adaptive toolpath capabilities, realistic simulations, and much more. Learn about the latest CAD-CAM technology and strategies that can save you time and money during one of BobCAD-CAM’s live webinars. Gain professional certification by attending a local three-day training seminar, offered at both basic & advanced levels. Access tons of free standard post processors through the support portal, or have BobCAD-CAM customize one to fit your needs. Send tough or tight deadline jobs to our experienced CAD/CAM/CNC programming team and get them out the door on time. Get the help you need to get the job done right from our team of experienced support technicians. We’re ready for any challenge. BobCAD-CAM simplifies CAD-CAM programming so you can spend less time guessing and more time machining. Our cutting edge CAD-CAM solutions streamline the design and machine programming workflow and give you the power to handle your most demanding jobs with ease. Whether you’re a leading manufacturer or just getting started, BobCAD-CAM has the features, training, and support you need to get the job done right. This free CAD-CAM trial gives you full access to try BobCAD-CAM’s new advanced surfacing toolpaths, Dynamic Machining Strategies™, wizard driven interface, CAD design tools, simulation, and much more. Download it today and see how fast and easy CAD-CAM programming can be.